MiTAC Pluto E230 is built the latest generation of Intel Apollo Lake. The whole new SOC structrue packs more powerful capability for your tasks or applications. 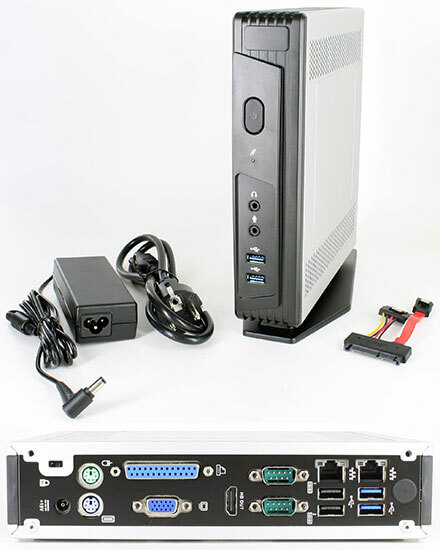 The E230 has a 2.2 liter fan-less chassis design and gives it the flexibility to adapt to every workspace and environment, whether implemented as an Embedded Box PC. VESA mount support allows for space-saving and rear-mounting on flat-screen displays. Flexibilities also mean a rich array of I/O ports (including 2 x PS/2, 4 x USB 3.0, 2 x Ethernet Rj45, 1 x VGA, 1 x HDMI out, 2 x Serial port, 1 x DC Jack, 1 x Kensington lock) to add a variety of peripherals. Storage expandability is supported for high-density hard drives. Two M.2 slots provide the support of SSD and wireless interfaces which allow effortless connection to Wi-Fi and Bluetooth networks. D-Sub and HD-out extend your visual experience with support for dual diaplays. Long term availability until at least 2019 !